Clutch City was home to one of the most anticipated all Texas shoot-outs of the year, as Kutiss Colvin of Austin and Eddie Ortiz of San Antonio met up to renew the always hot San Antonino/Austin rivalry and fill the vacant ABF Middleweight title. Colvin entered the heavy favorite and all eyes were on “Mr. Oohwee” in anticipation of seeing something spectacular against the 6-0-2 prospect from San Antonio, Eddie Ortiz. However, it was not to be, and there was a passing of the torch. The 26-year old San Antonian caught the attention of Colvin, the veteran, by outboxing and out jabbing him in the first round. Rounds 2-4, were highly competitive and tough to score as the athleticism and powerful right hands of Colvin and Ortiz’s slick boxing and moving, seemed to create very competitive and difficult rounds to score. In the fifth, another difficult round to score, it appeared that Ortiz was physically stronger and began to break Colvin down. Going into the final three stanzas the fight looked completely up for grabs and Ortiz took control as Colvin begin to fade. Ortiz dominated the round with his jab and appeared to hurt him just before the bell rang to end the round. The seventh picked up where the sixth ended with Ortiz out jabbing Colvin and landing precision left hands as he continues to break the veteran down with crisp 1-2’s down the middle. With each man knowing perhaps the needed to take the last round, the boxing match was thrown away and the two stood toe-to-toe in a phone booth fight, where each fighter certainly had moments but it was Ortiz who seemed to have just a bit more on mustard on his shots and had just a few more of them to take the final round to give Alamo City the win in a close but unanimous decision for Ortiz and to take home the vacant ABF Middleweight title. Ortiz knowing the significance of a win against a veteran like Colvin said he was “just trying to win every round” and when Colvin “put his foot on the gas I was going to raise the stakes and go a little higher” he also told us yesterday that he “knew he (Colvin) was overlooking him” and perhaps that was the case as Colvin looked a bit surprised on how skilled and polished his younger opponent was. Colvin’s went on to ask Ortiz for a rematch, something that Ortiz said he would be open to. Hopefully, we get part two of this San Antonio/Austin rivalry sometime in 2019. However, Ortiz who holds the 160-pound ABF strap said he is able to fight anywhere from 154 to 168. As a highly skilled 6’2 southpaw, with a ferocious body attack, he will be more than a handful for anyone at any of those weight classes. In the co-main event, the relentless Randy Fuentes pulled a major upset and improved his record to 8-7-1 by stopping 17-1 prospect Craig Callaghan originally of Liverpool, England now training with Bobby Benton in Houston. It was a constant battle of bull vs matador and it was the bull who relentlessly broke down the matador. Fuentes brutally broke Callaghan’s jaw causing him to retire at 44 seconds of the fifth round. Fuentes seemed to have been successful in breaking down Callaghan a round prior when he landed a series of straight left’s that shook up and stunned the Liverpool native. Callaghan had some level of success at times outboxing the shorter Fuentes but ultimately couldn’t keep him from getting on the inside and had absolutely no answers when he did get inside. Fuentes, of McAllen, Texas has pulled two upsets in the last few months as he was able to score a TKO of Kenton-Sippio Cook. The undercard also featured David Limerick of Katy, Texas who scored a second-round TKO causing his opponent to quit on his stool after unleashing a series of lethal body shots. Eduardo Garcia also of Houston, scored a very impressive unanimous decision, showing off a dominating jab as well as tremendous footwork. In other bouts, Donald Reed of Houston took an all-action back and fourth Texas shoot-out with Mission, Texas native Alex Gaytan. Gaytan who was able to go on the road and pull an upset over unbeaten Kendrick Ball in Massachusettes back in June could not continue playing spoiler as the Hometown Reed, was able to take the last round with his superior hand speed and jab to secure the very close and competitive decision. Also, former world bantamweight champ Clarence “Bones” Adams has a new sensational Super Bantamweight prospect of his own he is training. “The Beast” Raeese Aleem stayed undefeated (13-0, 7 KOs) with a one-sided 5th round TKO over tough ring veteran Derrick Wilson. 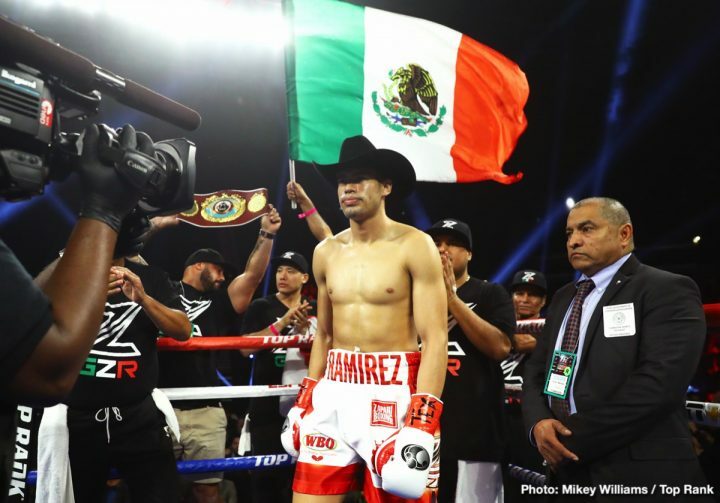 In the other major Texas card in Corpus Christi, which streamed on the ESPN+ app, Mexican, WBO Super Middleweight champ, Gilberto “Zurdo” Ramirez successfully defended his belt over the more athletic and equally as rugged Jesse Hart of Philadelphia. Zurdo, hurt his left elbow and with one hand, the southpaw nearly knocked Hart down in the final stanza, hurting his man several times in the final stanza, around that may very well go down as the “Round Of The Year” . Ramirez took a very close MD, two of the cards were in his favor 115-113 and the third was even 114-114. 3DBoxing scored the very controversial, and hotly debated fight 115-113 for Ramirez as well. In an undercard bout, the rugged Oscar Mojica spoiled the US debut for highly touted Mexican Super Flyweight prospect Ruben Vega and made him settle for a draw in their six-round affair. We warned of Mojica’s ability in an episode of Lone Star Round-Up. Mojica has been in the ring with, Ernesto Delgadillo, Elton Dharry, Jose Martinez, and Antonio Nievez, has never been stopped and gave each and every one of the names above all they could handle. Mojica is nobodies tomato can and is a threat to any of the names at 115. The Charlo twins of Houston Texas are scheduled to co-headline a card in Brooklyn’s Barclay center on Saturday the 22nd. Jermall Charlo was set to take on Willie Monroe, that bout which is the main event, is now in major jeopardy. According to World Boxing Council president Mauricio Sulaiman, Willie Monroe Jr. had an “adverse finding” in his VADA testing more news should be broken on this early in the upcoming week. The Charlo Bros. made headlines earlier in the month when they failed to appear for their mandatory VADA testing. Perhaps Monroe should have taken a play out of the Charlo’s playbook and not taken the test at all. You can’t fail a test you don’t take, right? Russian contender, Matt Korobov’s may be used as a replacement for Monroe depending on the WBC’s verdict. Jermall’s twin brother Jermell is scheduled to defend his WBC 154-Pound belt against Tony Harrison of Detroit.